I met Sarah Evans at the Chicago stop on the Mashable Summer Tour. 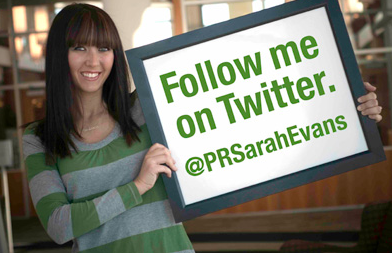 Sarah is the owner of Sevans Strategy, a public relations and new media consultancy and runs a popular PR blog at PRSarahEvans.com. She created and moderates #Journchat, the weekly live chat for PR professionals, journalists and bloggers on Twitter. Sarah also finds the time to interview celebrities and news makers on Sara Evans LIVE. She’s the social media correspondent for SWAGG, and can be seen in the February 2010 edition of Vanity Fair’s America’s Tweethearts, Forbes’ 14 Power Women to Follow on Twitter and Entrepreneur’s Top 10 Hot Startups of 2010. I quickly realized at the Mashable event that Sarah had quite a following. I’ve come to learn that social media is an important part of the domain industry and who better to help educate me than Sarah? Mike: To start out, can you tell me how you got involved in public relations? Sarah: Even before understanding public relations, I always had an affinity for connecting people in meaningful ways. At two years old, I planned tea parties for friends – the starting point to a career thirty years later. Mike: What are some of the reasons business come to you and what services do you offer? Sarah: Sevans Strategy clients consist of businesses interested in listening to and tapping into online conversations about their brands. We help to keep a pulse on social media and identify and build mutually beneficial two-way conversations with online influencers and other audiences. Mike: You describe yourself as a “social media freak,” is this a key factor in your success? That is, has the talent you have for maximizing the impact of social media influenced your success? Does this apply to industries other than PR? Sarah: Social media “gurus” and so-called “experts” come out of the woodwork everyday – as I’m sure is the case in every other industry. The question is, can they back it up? My following on Twitter, Facebook and on other social media platforms supports my “social media freak status” – but honestly, my unrestrained addiction to social media and the work we complete for clients stands as our key factor in success. Mike: Do you feel that if a business isn’t taking advantage of the social media platforms available, that their business is missing some opportunities? Sarah: A business might be missing out on opportunities, especially if they don’t have the time or the resources to allocate to a social media campaign. Social media takes time, strategy and creativity and is based on “Return on Engagement” (ROE) as opposed to ROI “Return on Investment” (ROI). Companies looking to engage with stakeholders, bloggers and other key communities have a better chance of success than those looking to sell or advertise a product or service. Mike: You, @prsarahevans, have almost 50,000 followers on Twitter and you’re listed almost 4,500 times. This is almost incomprehensible for me. What is the influence of such a far reaching social media audience? Is this an anomaly, or can others learn to do this as well? Sarah: Influence shouldn’t be measured based on the number of followers, but on the ability to resonate. I’ve come across people with a substantial following but have no knowledge of how to engage, so their content goes unheard. Mike: In your opinion, what is the next phase or generation of social media going to look like? How can we, as business owners, begin to prepare today for that? Sarah: Mobile apps continue to have enormous impact on society. Instead of reading the New York Times or The Wall Street Journal print edition, or even online, people are tuning in with their smartphones or iPads over the morning coffee. We’re an efficient, fast-paced society. We’re not going to take the time to log into the Internet to check in on Foursquare, we’re pulling out our smart phones and clicking the app. Turns out she lives in the town next to me. I think Sarah is amazing. Trademarks, Cybersquatting, Contracts… Did you know?